Redirect a user to the login page. 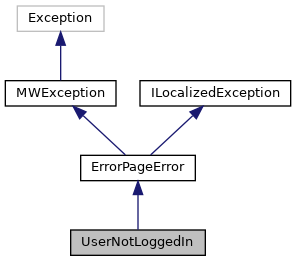 This is essentially an ErrorPageError exception which by default uses the 'exception-nologin' as a title and 'exception-nologin-text' for the message. In order for this exception to redirect, the error message passed to the constructor has to be explicitly added to LoginHelper::validErrorMessages or with the LoginFormValidErrorMessages hook. Otherwise, the user will just be shown the message rather than redirected. Note the parameter order differs from ErrorPageError, this allows you to simply specify a reason without overriding the default title. Definition at line 53 of file UserNotLoggedIn.php. The value of the $reasonMsg parameter must be set with the LoginFormValidErrorMessages hook if you want the user to be automatically redirected to the login form. Definition at line 66 of file UserNotLoggedIn.php. Redirect to Special:Userlogin if the specified message is compatible. Otherwise, show an error page as usual. Definition at line 78 of file UserNotLoggedIn.php. References $context, ErrorPageError\$msg, $output, $query, RequestContext\getMain(), MediaWiki\getTitle(), SpecialPage\getTitleFor(), LoginHelper\getValidErrorMessages(), MWException\msg(), and wfArrayToCgi().